Chris (www.pilgrimchris.com) and I headed to the hills again last weekend for another walk in our #MicroAdventure calendar. We had planned to do this trip in the last weekend of February, but for various reasons we couldn’t make it, so although this was now March, we still classed this as our February #MicroAdventure. One of the interesting things about these little weekend jaunts is that the walk itself takes a backseat to the camp and the ‘adventure’ aspect. 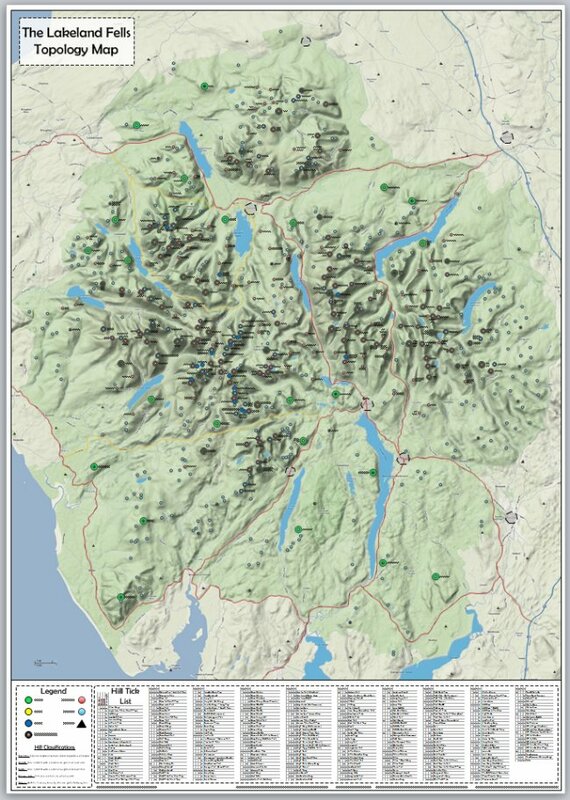 We can plan a short walk to a location we like the look of and enjoy the experience rather than concentrating on getting miles done, or visiting summits. Chris fairly rocketed up the M6 in his new car and we arrived way too early in Kettlewell village, so early in fact that all three pubs were closed, so we headed for a café instead, hoping for a late breakfast and a pot of tea. Unfortunately, the 21st century doesn’t appear to have arrived in certain parts of the Yorkshire Dales yet and the café only accepted cash. A quick search of pockets produced 27p, a button, a short piece of string and a blister plaster. We got back in the car, abandoning a perfect little parking space and headed down the road again, beneath the hugely impressive Kilnsey Crag, to Grassington where we found 10,000 tourists and more coffee shops than a high street in Kensington. We can both heartily recommend the Corner House Café which does an excellent Bacon Sub and a great Full English. It wasn’t as expensive as we feared either! An hour later we were back in Kettlewell, only to find our little spot filled with a big 4×4, but soon procured another one a little distance away. The main car park was full by this time and the Dales Way path was quite busy with families and couples strolling, as we headed out. 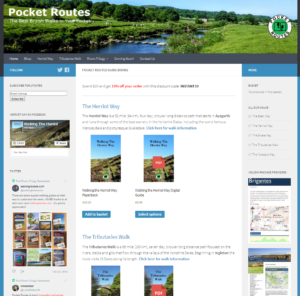 The plan was to follow the Dales Way, beside the River Wharfe for a couple of miles to Buckden, then climb the wonderful path beside Buckden Beck to the old lead mine just beneath the summit. I hoped we would find a suitable spot somewhere round there for a quiet camp. As with our last trip our (see here) the wind was a big problem. We seem to be cursed with high wind on our trips. Three of the last four outings have been accompanied by howling gales. It wasn’t so bad along the Wharfe, the mostly sheltered route was great. The sky was sullen, grey, filled with low cloud and rain looked possible, despite the forecast. 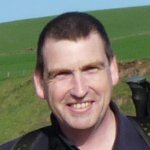 Chris reckons I’m cursed – everywhere else in the country was enjoying sunshine; “the best day of the year” he kept quoting, while we were walking under our own personal cloud layer. We could see the sun, miles away, over the Lake District in the west, filtered and dulled by the intervening low cloud, but no warmth reached us. To top it off, the wind began to rise steadily as we climbed beside Buckden Beck. The waterfalls were superb, in full flow with the snow melt from the higher fell and from recent rain that had left some sections of the path running wet and muddy. I began to struggle as we climbed – I’ve been working hard on my fitness over the last few weeks, but I still felt tired under the full winter pack – my new Gossamer Gear Mariposa Robic. By the time we reached the lead mine I couldn’t face the short diversion to the summit and managed to persuade Chris we should search for a secluded spot for an early camp. The lead mine would be a good spot on a calm summer evening, there’s a great, flat spoil heap with fine westerly views, so the sunset would be centre stage, but it was open and exposed and the wind prevented a pitch here tonight. We collected water at one of the many streams above the mine and followed a thin path south around the face of Starbotton Fell. The wind was coming from the south and it gusted strongly. The wall that could have provided shelter still had a deep snow bank on the leeward side and this prevented any pitch close enough to take advantage of it. There weren’t any suitable flat places either. Chris dropped his pack and headed up Starbotton Fell for a closer look at the upper wall, but that was no better. 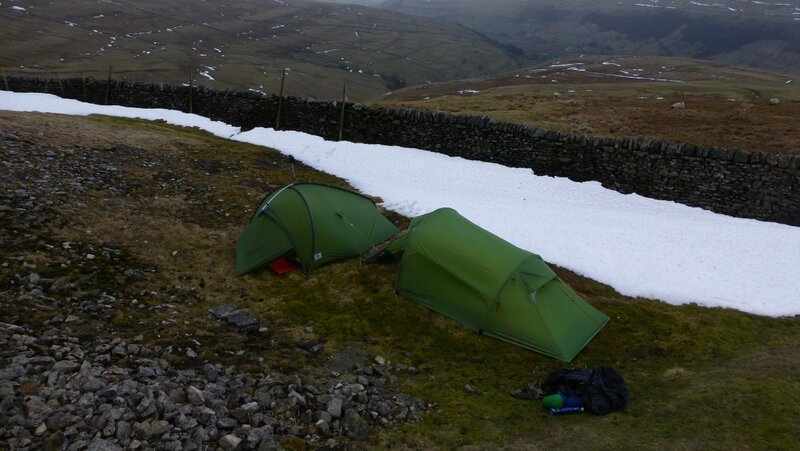 We carried on around the wall and eventually found a good flat spot beneath a steep bank opposite the wall, it offered good shelter and was flat and big enough for both tents – just. Chris is testing a two man tent at the moment and the footprint is gigantic compared to his old one, and in the end we needed every inch of the flat space to get set up. We were out of the wind, mostly and still had plenty of light left, so we made our camp comfortable. I piled a bunch of loose stones from the bank to make a bench and we got stoves going and made tea. Chris is also testing some freeze-dried camp food from BaseCampFood and he’d brought one along for me to test too. I was immensely impressed with the Pork Stew. It looks a lot better than the meals I normally use and it tastes as good as it looks. We managed to sit out chatting for a while this time, unlike our previous couple of camps where it’s been just too cold. 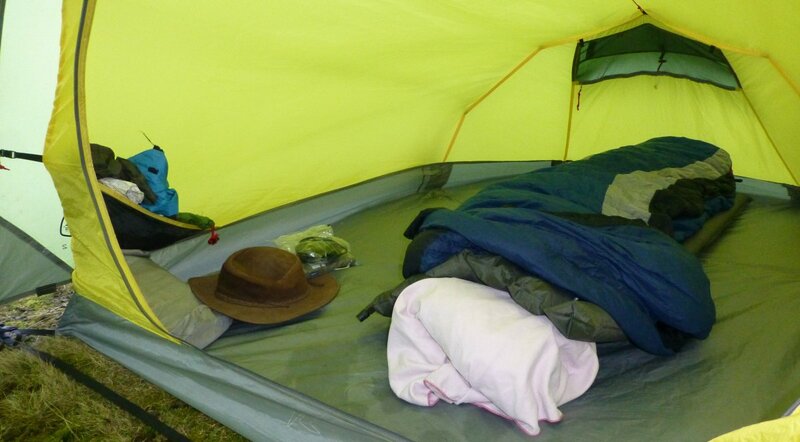 Chris spent an uncomfortable night in his massive tent as his sleeping mat had sprung a leak and although mostly flat, the ground was hard and stony. Once it got too cold, we watched movies in our tents and chatted again until we both fell asleep; me soundly, Chris not so much. I slept soundly until about 4am at least. The wind was much stronger and it had breached our defences – my tent was shaking and flapping and it began to rain, I couldn’t return to the land of nod. I unzipped to have a look out, unnecessary really, it was raining hard and the wind was swirling around the little hollow, cloud was all around us. Chris heard my zip and called across, he wasn’t a happy camper, he was closer to the cold ground that I was! We agreed to move sooner rather than later and I must have fallen asleep again, because it was 6am when I heard Chris starting to pack up. 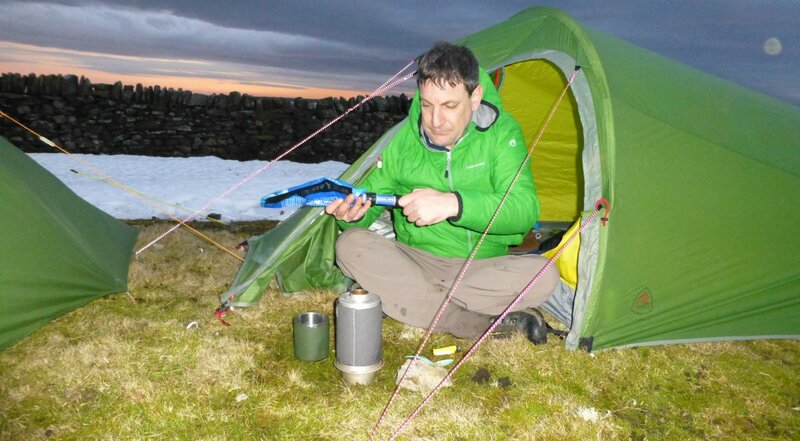 I had a quick brew and a couple of flapjacks and packed away inside the tent. It was shuddering badly now and flapping angrily and the rain was still coming down hard. My new pack means I can pack everything away into my dry bags, stow it in the pack and then get out into the rain and cold, roll up the tent and slide it into a side pocket on the pack. This was a huge advantage today and we were soon out and walking. It was about 7am and we couldn’t see a thing beyond 10 yards. The wind was ferocious and the path was pretty bad in places. Misty walk back to Kettlewell, with some gusty winds too! 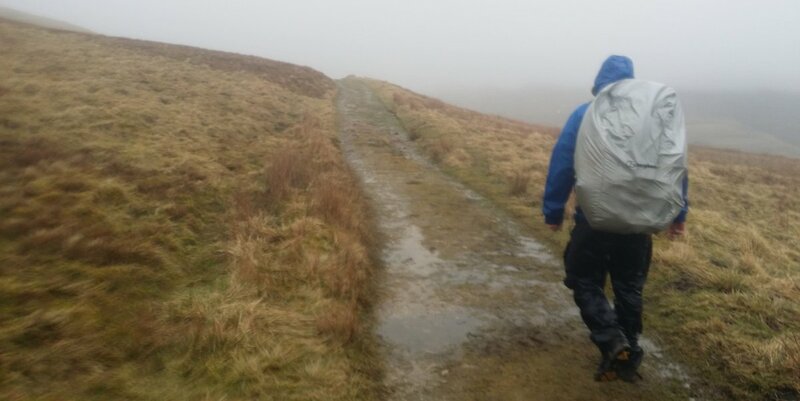 Despite the 40mph winds, the rain and the boggy track we were both smiling pretty much all the way down the hill, it was great to know we had a car waiting just a short distance away – another great thing about a #MicroAdventure! We spent two hours trying not to fall over, or be blown over and eventually made it back to Kettlewell safely. The perils of walking in the UK winter had been made clear to us, but we both agreed it had been a great weekend and there’s nothing I’d have rather been doing! 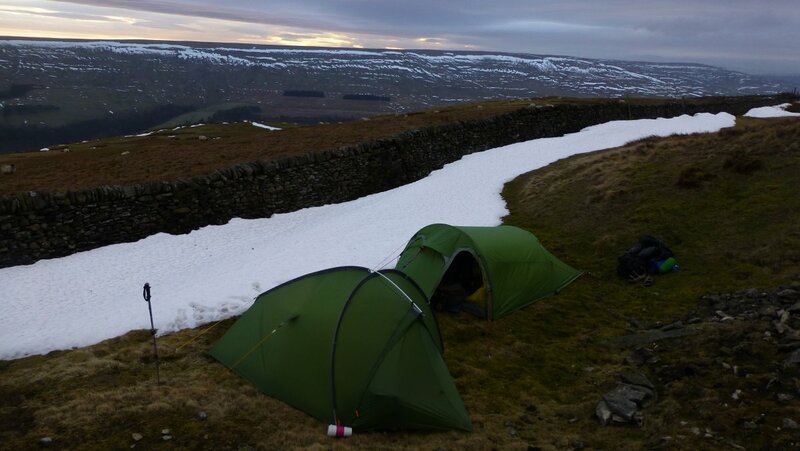 If you want to read about other people’s #MicroAdventure then you can use that hashtag on Twitter, or Martin Black has been compiling some of the best blogs on his site; you can find a round-up of January and February there. Actually, it is surprising what you can manage with, if needs be!